The fame of Petrarch in France is in large measure centered on the Triumphi, in particular through visual representations in illuminated manuscripts, and in translations into French of the poetry. 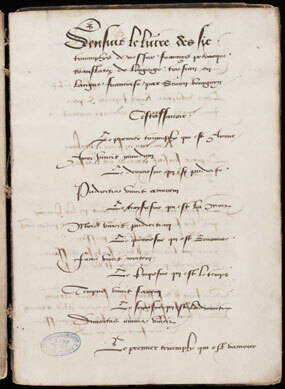 Although others had made prose translations a few years earlier, Simon Bourgouyn, member of the court circles of Louis XII, was probably the first to translate the Triumphi into verse. He made his translation in the early 17th century. As had been the case with his translation of Ovid’s Metamorphoses, Bourgouyn added moralizing commentary to the poetry, to adapt work to the taste of the highest levels of French nobility.